Magic realism, bluegrass, metaphysical landscapes, whiskey, a highway to nowhere and everywhere. 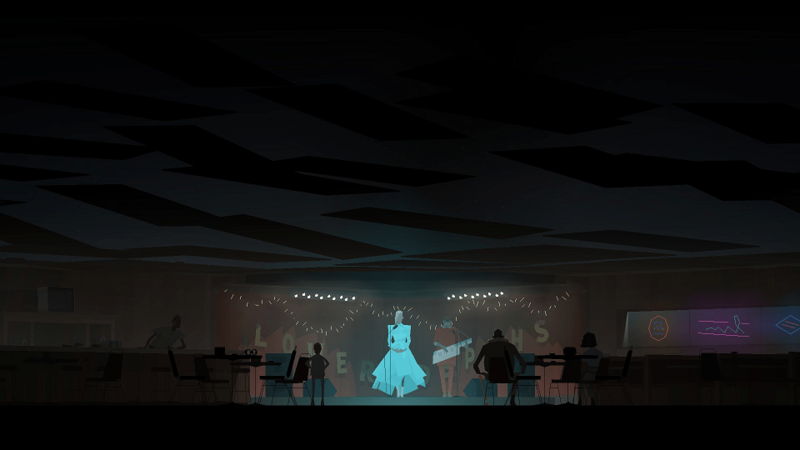 This is the stage for Kentucky Route Zero, an ongoing point-and-click adventure game that is now in its third of five planned “Acts.” Released nearly two years ago, I’ve sporadically checked in with this game throughout its progression and, every time, I sit down with a bottle of bourbon at night and enjoy the ride this game takes me on. You observe and interact and explore this slice of the American South through a cast of characters who are each dealing with some hefty baggage, guiding them as they constantly seek out this mythical Route Zero and where it will hopefully lead them. Peppered throughout are many choices, most in terms of dialogue. However, unlike most other games with such mechanics, here the choices are more reflective of you the player; merely influencing the flow of conversation between characters rather than doling out win or lose scenarios with each click. What you choose is incidental, be it a sly remark or the naming of your dog, but that doesn’t mean it’s unimportant. Honest questions with no solutions, only honest answers. That is not to say there aren’t consequences, but here it is only you who can judge whether or not you were successful. You will never see all of the dialogue in one play-through, nor should you. You are not necessarily playing a book, you are playing the creation of a story. The ramshackle cast brings together an ensemble of lonely, scared, eccentric, and hurt individuals who have each collided with one another in the Kentucky night. They all have unique motives, from Conway: the gruff antiques delivery driver making his last job to an address that may not exist; to Shannon: a young woman who repairs old TVs and is searching for her only remaining family, who may not even be alive. As well as that their pasts are delved into with each new bit of dialogue, with characters like Ezra and Julian; a young boy and his giant bald eagle brother, left alone to fend for themselves after their parents lost their home and disappeared from them one night. Add to that Junebug and Johnny, a pair of punk musicians and former robotic-mining-drones who escaped their programming to travel the land as bards, and you’re left with a cast that is constantly running away from while simultaneously running toward something. 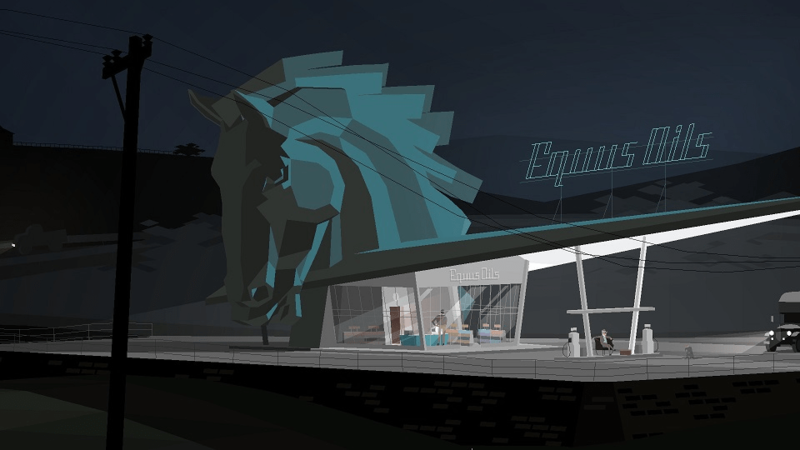 The game opens with Conway stuck looking for directions at Equus Oils, a gas station in the middle of nowhere, with a building that is both insignificant yet somehow monolithic with its giant horse head statue resembling a surrealist work by Giorgio de Chirico. There you meet Joe, the blind owner who writes poetry on his old computer, complaining about a broken TV he can’t even watch. This immediately sets the tone for the rest of the game, a series of sets and people that contradict one another and their surroundings. The dreamlike nature of the music and visuals ease you in, leading you down a path, any path, the game reveals to you which is fraught with heavy subject matter and tragic discoveries. The grounded nature of KRZ’s themes being wrapped in a dreamlike atmosphere continues in Act II with the reading of a rejection letter from an architectural institute addressed to one Lula Chamberlain; one of many clerks at the mysterious Bureau of Reclaimed Spaces. We merely get a glimpse of life here, in an office complex with a third floor filled only with complacent bears built into a cathedral within the depths of the legendary highway, but even on the Zero it seems that everything is just as bleak and awkward despite the surreal landscape it occupies. The presentation of KRZ as a stage play is hammered home here, too. The use of buildings within buildings and the lighting involved resemble backdrops and models, further use of walls and environments peeling away out of frame evoke the sense of a stage set being pulled behind the curtain. We even have the re-appearance of a “Greek chorus” in an ever-present trio, following the characters and offering commentary on the goings-on of the game. Previously we’ve also seen diegetic music used, with the trio filling the roles of a bluegrass band called The Bedquilt Ramblers, lingering in the foreground and background as shadows or playing on radios and TVs. All of these elements become more noticeable in Act II and this persists into Act III. The third Act of the game utilizes these themes and motifs it has established to tackle a question asked in the first Act, a philosophical query of whether people can be just as haunted as places. Everywhere in this game is haunted, from the empty church found with only a tape recorder of hymns endlessly looping to the virtual world you discover built within an artificial intelligence buried under rock and grime and fire. The spectres of their occupants remain but never in a malevolent fashion. These ghosts cannot hurt you, they have no desire to, they merely watch without judging and leave you to be the arbiter of your own fate. Everyone in this game is haunted, by their choices and actions and words and inaction and things they wish they had said. What Act III accomplishes is further delving into what exactly haunts these characters and even your average person. Despite their fantastical quests and backgrounds, these are people with heart and emotions and desires and fears. What haunts them isn’t anything so out-of-this-world, but very mundane terrors such as debt, addiction, loss, and fear of commitment. It’s what makes the characters so effective at drawing you in. They aren’t conventional, not in the slightest as you parse together their mindsets and excuses and moods and quips through the dialogue options, however they’re relatable. You may not be searching for your cousin who appeared to you on a broken TV one night, but you might be begging for a way to contact someone you sorely miss but can’t admit you do. Despite its nature as a point-and-click adventure game with dialogue choices, the game as a whole but especially Act III takes some very bold moves in knowing when to strip away you, the player, of these abilities, your few powers in this strange landscape, your only ways to dictate anything whatsoever. It does so to stress how much of life is out of our control, and to make us re-evaluate what gives us strength and authority in these types of games as well as others. 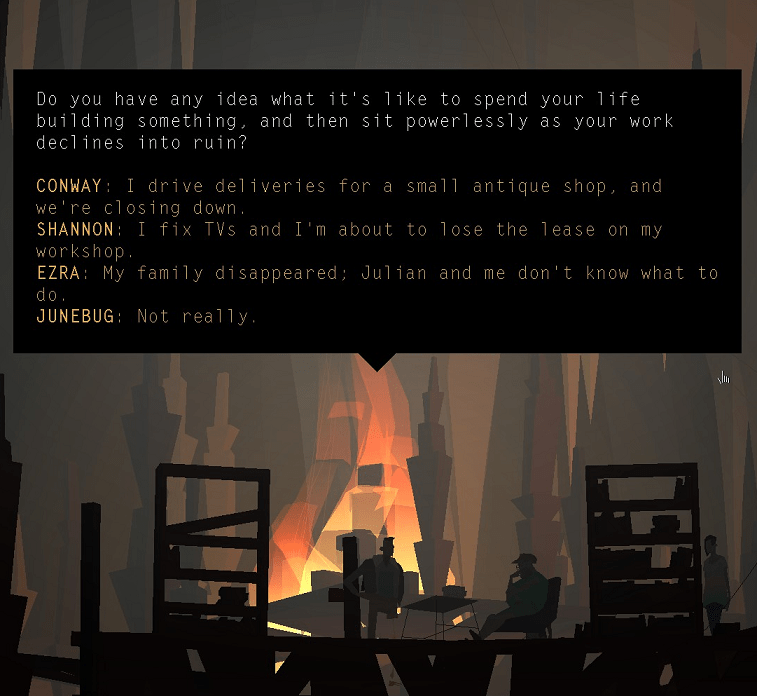 I can say without a doubt that Kentucky Route Zero is a very important game, as well as being both enjoyable and surprisingly accessible. Quite a lot of it is surreal and off-kilter, and there are disturbing visuals and dissonant sounds that may drive some away, but as a whole I believe this is a game anyone can play. And that’s not a fault in the slightest, because it elevates it to the same status a good book or movie you’re recommended has earned. It requires no twitch-reflexes to master, nor a Sherlock-esque mind to unravel the mysteries buried within, all you need is a mouse, a monitor, and a healthy appetite for adventure. A beautiful world of contradictions. Many times I found myself closing my eyes and taking my hand away, soaking in the beautiful sounds of the game, left only with my thoughts. Or sometimes just taking off my headphones and marveling at the visual feast the game provides. There are few times I can name where I’ve experienced such moments. Much like Route Zero itself, this game is a gem that’s frequently forgotten about, or considered a burden too heavy for most people. However in that same regard I believe it’s an important road we should all travel down at least once. It holds so much potential, but just as the game’s choices leave it up to the player, it’s up to us what we get from that and make of it. Well, Jules, now I have to buy it. Sigh.